This textbook is suitable for the following courses: Risk Management and Insurance. Risk Management for Individuals and Enterprises introduces one of the most critical topics of study for 21st century students. The authors discuss how man-made disasters can have the potential to devastate the global marketplace. 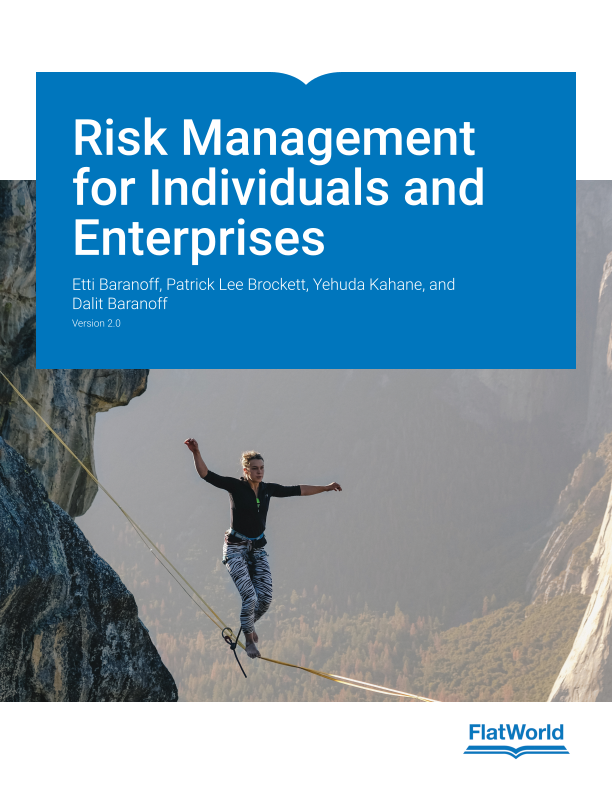 Every chapter is focused on risk management aspects and while many solutions include insurance, a main objective of this textbook is to ensure students realize that insurance is only one of many possible risk management solutions. The authors leverage their extensive and diverse teaching experience and research and draw on core knowledge bases from law, engineering, finance, economics, medicine, psychology, accounting, mathematics, statistics and other fields to create a holistic decision-making framework that is sustainable and valuable to students. This new edition has been extensively updated. Key updates and additions include Chapter 4: Enterprise Risk Management, Sustainability, and InsurTech Innovations; Chapter 5: Financial Risk Management Using the Capital Markets; and Chapter 11: Property Risk Management, Cyber Risk, and Global Risk Exposures. Chapter 23 provides up-to-date hypothetical case studies for students on a diverse set of topics. In addition to new content, it includes a modernization of the links section of each chapter. Introductions to chapters with section links to highlight the relationships with between various concepts. Presents insurance as a risk management solution. Cases embedded within each chapter. Dr. Etti Baranoff is an Associate Professor of Insurance and Finance at Virginia Commonwealth University in Richmond VA teaching risk and insurance, employee benefits and financial risk management since 1995. From 2010 to 2016 she also served as an external research director for the Insurance and Finance Program of the Geneva Association, an Insurance Think Tank based in Switzerland. She served as an independent expert on all fundamental and theoretical work in the area of Insurance and Finance (IF) and was the editor of the Insurance and Finance Newsletter of the Geneva Association on issues regarding financial stability and international macro regulation of all sectors of the insurance industry relating to systemic risk and financial stability issues. Her Insurance work spans 40 years, 25 years in academia with publications in prominent journals, including The Journal of Risk and Insurance, The Journal of Banking and Finance, The Geneva Papers on Risk and Insurance, and American Journal of Accountable Care (AJAC), among others. She is currently on a few Journal’s editorial boards. Her current focus is on Blockchain and disruptions in insurance, health insurance utilizations and performance by specialty segments. Her financial stability research includes over 50 published articles in solvency detection of insurers, capital structure and market discipline. Dr. Baranoff began her insurance career in 1978 when she joined American Founders Life Insurance Company in Austin, Texas as a Pension Administrator. She moved to doing market research. In 1982 she became a Texas insurance regulator when she joined the Texas State Board of Insurance (Changed later to the Texas department of Insurance – TDI) as a rate analyst and later changed to be a legislative researcher. After 12 years at TDI, she moved to the Texas Association of School Board while also working with her professor (the late) Dr. Robert C. Witt. In 1995 she joined VCU. Dr. Baranoff is dedicated to her teaching and to improve the students’ understanding of the dynamic field of RMI. She is a former High School teacher in Israel with a teaching certificate credentials. Her first textbook Risk Management and Insurance was published in 2002 by Wiley & Sons. Her second co-authored textbook Risk Assessment was created for the ARM designation. In 2009 she completed a new version of the Wiley’s textbook with Drs. Patrick Brockett and Yehuda Kahane Risk Management for the Enterprise and Individuals published in 2009 by FlatWorld. A multiple-time winner of the Research Paper Award from the International Insurance Society and the prestigious Thales Grant. She is a member of ARIA, FMA and other association. She became a life member of the prestigious Risk Theory Seminar in 2017. Dr. Baranoff consulted on various cases and is quoted by many of the media outlets in the US. She earned a PhD in Finance with minors in Risk Management and Statistics from the University of Texas at Austin in 1993. She has a BA in Economics and Statistics and a Teaching Certificate in Social Sciences from the University of Tel-Aviv. Dr. Patrick L. Brockett holds the Gus Wortham Chair in Risk Management and Insurance in the University of Texas-Austin’s McCombs School of Business. He holds joint Professor appointments in the departments of Finance, Mathematics, and Information, Risk and Operations Management. He is a Fellow of the Institute of Mathematical Statistics, the American Statistical Association, the Royal Statistical Society, the American Association for the Advancement of Science, and the Institute for Risk Management. He is an elected member of the International Statistical Institute. He served as editor of The Journal of Risk and Insurance for 9 years, and has served on the Board of Directors and as President of the American Risk and Insurance Association. Currently he is Editor of the North American Actuarial Journal. Dr. Brockett’s articles have won awards from the American Risk and Insurance Association, the American Statistical Association, the Society of Actuaries, the International Insurance Society, the Casualty Actuarial Society, the National Association of Insurance Commissioners, as well as from the Faculty of Actuaries of Scotland, and Institute of Actuaries in England. His most recent research awards are the 2017 Spencer L. Kimball Prize from the National Association of Insurance Commissioners, and the 2017 Best North American Actuarial Journal Article Award from the Society of Actuaries. Dr. Brockett served on three National Academy of Sciences research committees on the National Flood Insurance Program, and served as an integral member of a University of Texas research team helping the Texas General Land Office in modeling damages from Hurricane Harvey in 2017. He continues to serve as a member of the Board of Directors of the Texas Property and Casualty Guaranty Association. Dr. Brockett has published 2 books, 5 monographs, and over 185 scholarly articles in a variety of journals across many disciplines. He has directed PhD students in Finance, Mathematics, and Risk Management and Insurance. Prof. Yehuda Kahane is a Fellow (and trustee) of the World Academy of Art and Science (WAAS). He is the 2011 recipient of the prestigious Insurance Founders Award by the International Insurance Society, for his contribution to the theory, practice, and education in risk management and insurance. In that same year, he was also awarded for his lifetime achievements by the Israeli insurance industry. During the last 2 decades his focus was mainly on the environmental and societal risks that threaten humankind’s survival on planet Earth. He offers practical, feasible solutions to mitigate these risks, based on the retirement and insurance industry (both private plans and social security programs). Insurers hold the key to the solution, since they are the only sources of long-term capital in the world. Kahane showed how insurers can globally finance the trillions of dollars that are needed annually for reaching the world Sustainable Development Goals (SDGs) that all countries accepted during the Paris 2015 summit. He showed how these investments can yield the high rates of return that are needed in order to create attractive retirement plans, and at the same time to handle two other critical risks: the employment and retirement insecurity of millennials. Kahane is a Professor (Emeritus) of the Coller School of Management and the Porter School of Environmental Studies, and headed until recently the Institute for Business and the Environment at Tel-Aviv University. He was the founding dean of the first academic school of insurance in Israel. During almost 5 decades he taught and researched in many universities around the world (including the Hebrew University of Jerusalem, the University of Florida, University of Toronto, The Wharton School of the University of Pennsylvania, the University of Texas (Austin), and others). All his degrees are from the Hebrew University of Jerusalem—BA (economics and statistics), MA (business), PhD (finance). He is a life and general insurance actuary (Fellow of the Israel Actuarial Association, The International Actuarial Association and others). He is a prolific writer, and served on the editorial board of the major journals in the area. He has a broad experience in sustainability, life insurance and retirement plans, ratemaking, datamining, social security. catastrophes, natural hazards, auto insurance, agricultural risks, portfolios, financial risks, digital currencies, technological forecasting, and long-term planning. Prof. Kahane is an active academic and business entrepreneur. He has a rich consulting background, and headed important committees on insurance matters. He was a major owner of three technological incubators and initiated technological startup companies in a variety of areas. A chairperson of the YK Center for the New Economy, he is also involved in philanthropic activities. Dr. Dalit Baranoff is a business historian specializing in the history of risk and insurance in the United States. Her dissertation, “Shaped By Risk: The American Fire Insurance Industry, 1790–1920,” was awarded the Herman E. Krooss Dissertation Prize by the Business History Conference. Since receiving her PhD from Johns Hopkins University, she has taught U.S. history, researched and written about diverse historical, business, and insurance-related topics, ranging from nineteenth century plantations to the dot.com era of the late 1990s/early 2000s. She has interviewed executives for corporate history projects and provided expert historical research in legal cases involving insurance. She also has extensive experience conducting archival research in government, corporate, and academic repositories. Dr. Baranoff is a fellow at the Johns Hopkins University Institute for Applied Economics, Global Health, and the Study of Business Enterprise. An independent scholar, researcher, writer, and editor, Dr. Baranoff’s recent academic work focuses on the U.S. health insurance industry, where she frequently collaborates with coauthor Dr. Etti Baranoff.